I wasn’t quite sure what I wanted from this race. I wasn’t expecting to actually get a place when I entered the ballot nearly a year ago, but I was delighted when I got in (though somewhat less delighted at the €100 price tag). I figured it’d take some pressure off my performance in London, but as it turned out, I got everything I wanted in London marathon – a PB, a GFA qualification, and a BQ (Boston qualifier), too. So all summer, I was left with the question of “what do I want to achieve in Berlin?” After training super hard for London, and then turning around and hitting the track all summer training for the British Transplant Games, I didn’t really have the drive to push the pain to gain a few minutes in Berlin. But what I had been wanting for a while was to run a really well-paced race, instead of going off to quickly at the start and then dying midway through and hurling myself across the line. So I ultimately decided that I’d use Berlin marathon to try to run an even pace, no matter what time that ended up being. The timing worked out that our favourite (street food-heavy) festival in Budapest was the weekend before the marathon, so my husband and I took the opportunity for a holiday through Bohemia – starting with the food and thermal baths of Budapest, to the schnitzel and prater in Vienna, to the beer, beer, and more beer of Prague, and finally ending with the marathon in Berlin. I can’t say that a week of absolutely gluttony and beer is the best way to prepare for a marathon, but in all honesty, I don’t think it did much harm, either, and it ensured I got to the start line very relaxed. 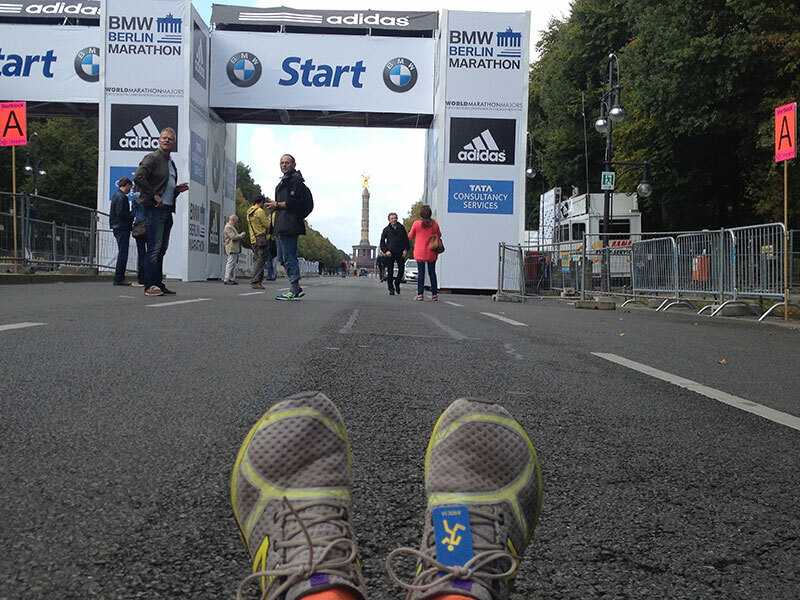 The day before – it wasn’t this empty on marathon day! After I dropped my bags off on the morning of the race, I headed to the designated gathering point that the Berlin crew (the wonderful Run Pack) had declared, where I ran into a bunch of our Run Dem Crew runners in addition to other friends from crews around the world I’d met in previous races. Since we were all in the same start pen, I ended up running with Christina from NBRO (whom you might remember from my Copenhagen marathon or Hackney Half race reports) and Luis, who lives in Portugal but runs with RDC whenever he’s in London. The three of us agreed to target somewhere around a 3:30-3:45 finish time, but keep it relaxed and see how things went. We settled into a groove, with Christina keeping an eye on the pace with her watch, and Luis and I chattering away happily, pointing out the sites and weird facts we’d gleaned from the guidebooks, high fiving kids, and pulling faces for the cameras. Above all, Luis and I decided that we’d remind ourselves to smile and remember that we were lucky to be healthy enough to run and appreciate the gorgeous, perfect day. The three of us got to halfway in a respectable 1:50, all feeling good, but Luis and I needed to stop for the loo, so we said farewell to Christina, who went on ahead. The second half of the race carried on much like the first – running at about 5:10-5:15min/km (just over 8min/mi), which felt relaxed and comfortable. We’d stop and walk through every water station so we could rehydrate effectively without getting it all up our noses, and Luis took advantage of the fruit on offer, while I stuck to my “gels every 5k” plan. Our pace dipped a little to 5:30min/km at about 30-35km, but we still felt great, and it meant we could take the mental space to really enjoy the atmosphere. 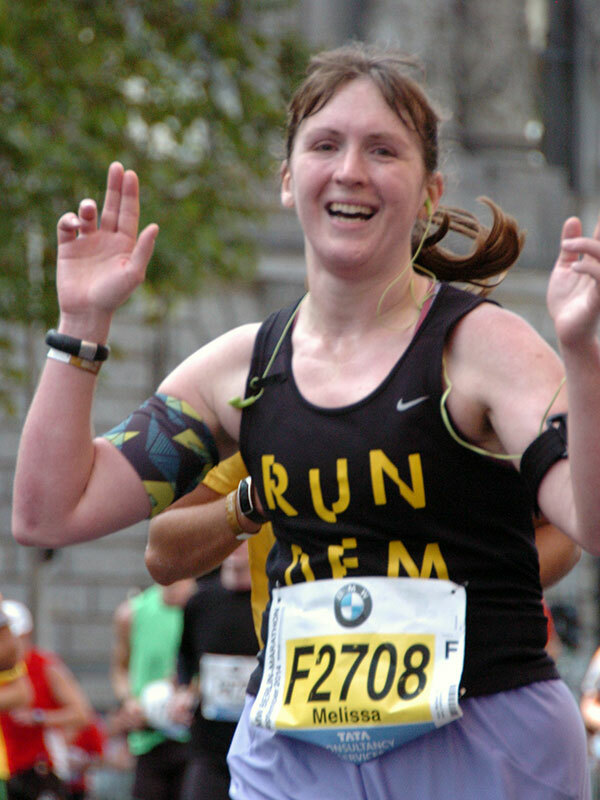 I personally preferred the Berlin course and crowds to London marathon – the course was flat, but I wasn’t expecting it to be so leafy (it was a sunny day, but I hardly noticed! ), varied, or interesting, and the crowds were present throughout, but not screaming in my face the entire time. Periods of relative quiet interspersed with a ton of charming little bands (some teenage garage bands, high school orchestras, jazz quartets, drummers, you name it!) meant we could appreciate the really loud sections even more when they came. One of the great things about racing in a city which has a sister crew is that they always lay down an epic cheering station. Fuelled by beer and Jagermeister, Run Pack really outdid themselves at KM37, and the boost I got from them and a kiss from my husband really gave me the kick I needed to crank it up again to the finish. In most of my marathons, I find that I get to KM40 and my pace picks up a little as I think “oh hey, there’s only 2km left – I got this!” but in Berlin, I was able to push the pace for the last 5km instead. I felt my form improve, I loosened my shoulders, and said to Luis, “Ok, let’s do this!”. We upped our pace back up to 5:10min/km and just blew through the last 5km, passing absolutely everyone, which felt amazing. 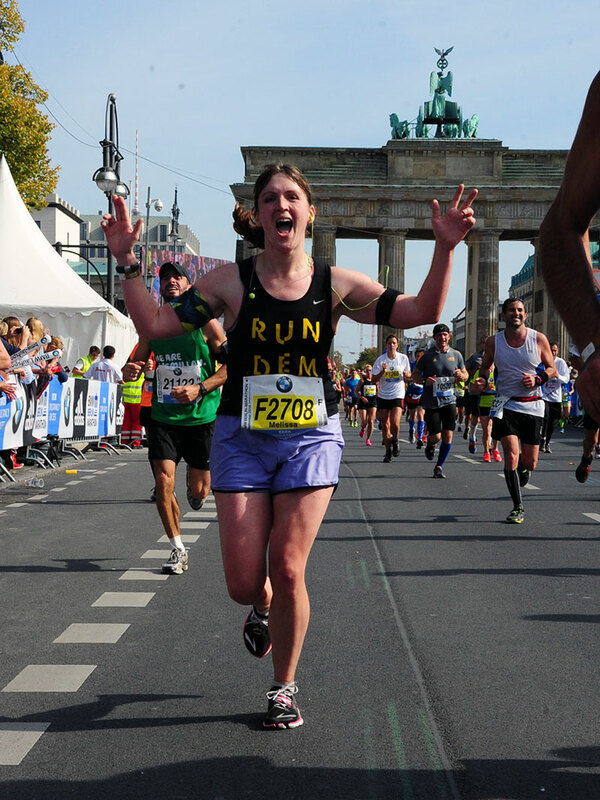 If you’re not familiar with the Berlin marathon course, you actually run through the Brandenburg Gate right before the end. 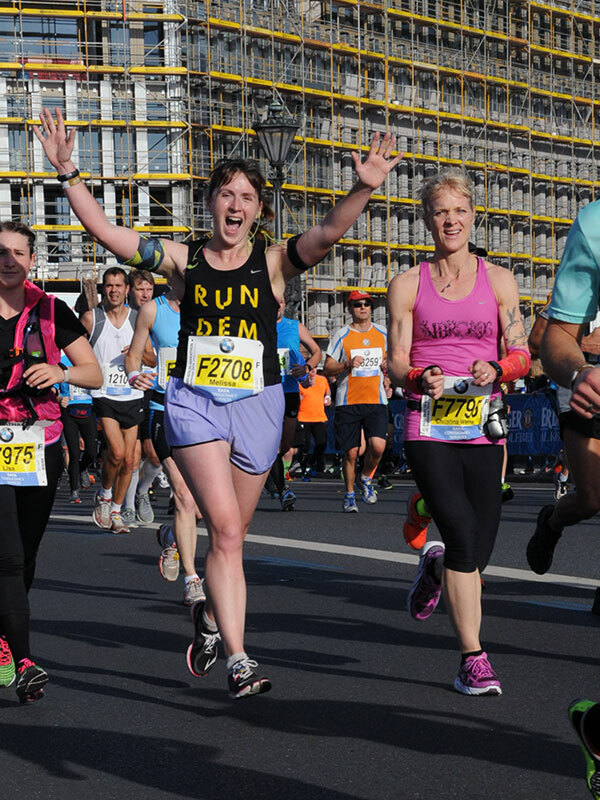 You go through Potsdamer Platz, turn a few corners, and there she is – and even better is that you can see the finish line just on the other side. We were already flying with massive smiles on our faces when we saw the Gate, but Luis insisted we run through the central span instead of the closer left one (he was totally right!) and we gave each and every camera a big smile and gunfinger, which carried right up through the finish line, where I gave Luis a massive hug. Together we finished with the exact same chip time – 3 hours 46 minutes and 5 seconds. Nowhere near a PB, but I honestly didn’t care! 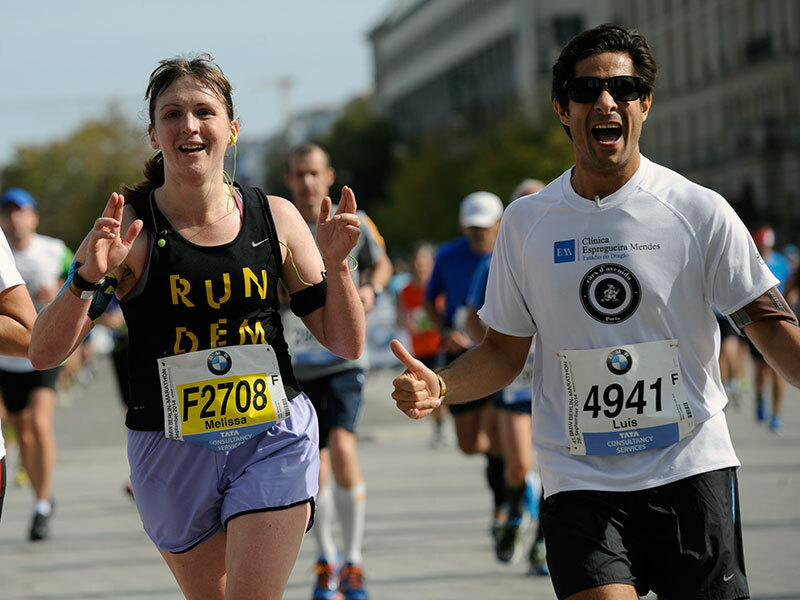 He was the best marathon companion I could ask for – full of energy, enthusiasm, optimism, and great conversation. There’s certainly something to be said about running relaxed – I finished this marathon with one blister on my right foot and a little patch of chafing under my right arm, but otherwise unscathed. 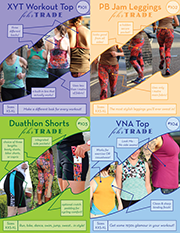 I’d also worn a pair of my Threshold Shorts – my latest sewing pattern designed and sewn by myself. I’m super happy with how these held up to the marathon distance, and the inner pocket in the back held my final two gels safe and secure, too. 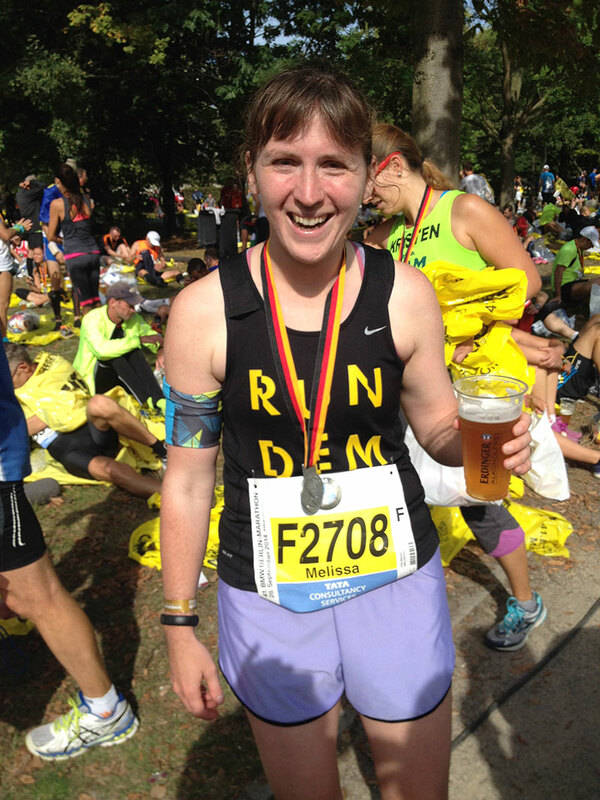 Oh, and the rumors are true – they really do serve (non alcoholic) beer at the finish line! You are a total star Melissa. I love reading your race reports and this one is no exception. So glad you had such an awesome race and seriously your time is still exceptional!!!!!!!! Will you really encourage me to enter the ballot for next year’s? I may have to see how my next one ( aaarg!!!) feels before committing to any others! !